『박태유 필적 백석유묵첩(朴泰維 筆蹟 白石遺墨帖)』은 17세기 후반의 문신ㆍ명필 박태유(1648~1696)의 필적으로 다양한 크기에 여러 서체로 쓰여 있다. 해서ㆍ행초ㆍ광초ㆍ예서ㆍ행서가 실려 있으며 그중 해서는 소해(小楷)ㆍ중해(中楷)ㆍ대자서(大字書)로 다양하다. 특히 칠언배율의 시를 중자 해서로 쓴 글씨는 그가 안진경 해서풍을 적극 가미시켰음을 보여준다. 또 행초를 섞어 쓴 칠언절구는 아버지 박세당의 서풍을 따랐는데 그 바탕은 안진경의 행초 필적에 가깝다. 또 한 면에 두 글자씩 대자 초서로 쓴 “사지격절(辭旨激切)”ㆍ“이식현오(理識玄奧)”는 광초(狂草)의 대가 당나라 회소(懷素, 8세기 활동)의 서풍을 연상하게 한다. 이밖에 예서로 쓴 “서유육의(書有六義)”는 한자의 조자원리(造字原理)에 관한 기본개념인 육서(六書：六義)란 점에서 이채롭다. 이상과 같이 이 서첩은 박태유의 서예적 면모를 충분히 보여주는 예로 필사한 연유나 시기, 글씨를 받은 사람의 이름 등이 적혀 있지는 않지만, 어느 누구의 글씨학습을 위하여 써준 것으로 여겨진다. 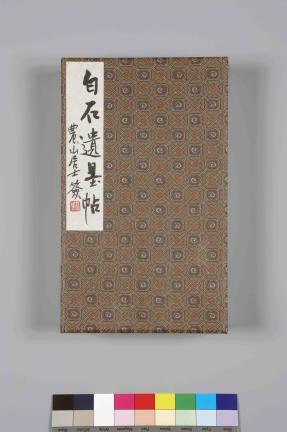 This is an album of calligraphic works by Park Tae-yu (1648-86), a scholar-official and calligrapher of 17th century Joseon. The calligraphic works are in various sizes of characters, and in various scripts, including regular, semi-cursive, wild cursive and clerical scripts. Regular script calligraphies are in large, mid-sized and small characters. Notably, in the seven-word rhythm poems written in mid-sized characters, in regular script, Park Tae-yu actively embraces the regular script style of An Jin-gyeong (Yan Zhenqing). 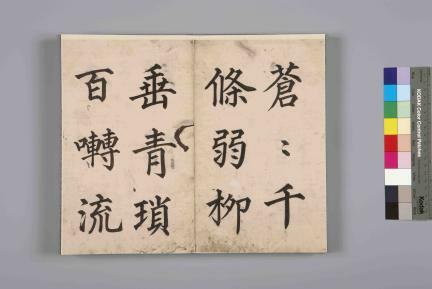 Meanwhile, in the quatrains with seven-word lines, written in semi-cursive script combined with cursive script, he emulates the style of his father, Park Se-dang, while also showing the underlying influence of Yan Zhenqing’s semi-cursive style. Finally, in the phrases Saji gyeokjeol and Isik hyeono, written across several pages, with two characters in each page, his calligraphy is reminiscent of Huai Su (8th century), the Tang calligrapher famous for his wild cursive writings. Otherwise, Seoyu yugui, written in clerical script, is also of interest in that it is related to ‘yukseo (six categories of Chinese characters),’ categories pertaining to the structural principles of Chinese characters. Brushworks contained in this album, highly demonstrative of Park Tae-yu’s calligraphic style, appear to have been made as study samples, although no date or information about how they came to be written or for whom they were written is mentioned.